This particular part of the book, you can see Harriet’s contempt for colonizers. Throughout the book, she talks about the two types of Jamaicas: the tourist side where there are beautiful palm trees and you drink fruity drinks and it’s paradise. Then there is the side where there is nothing but poverty, violence and misery that people choose to ignore because they don’t care about the people who live there. Descendants of people who were being sold during the Triangle Trade were more than likely the people living in the Dungle and didn’t get to experience the pleasant side of Jamaica. The Triangle Trade refers to the Transatlantic Trading system that was popularized in the 18th century. Africans were taken to Caribbean islands where they were forced to be slaves. Then they harvest raw materials such as sugar, cotton and tobacco and it was sent to Europe. 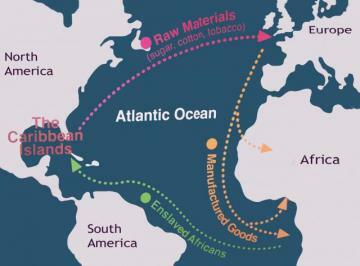 Then in Europe they would use these raw materials to manufacture supplies and send them to other countries. It was a cruel system that kept Africans enslaved and kept Europeans rich. When Harriet says that the tourists wouldn’t know, that’s because like most times, people never consider or care about who is producing their products. They don’t stop to think whose harvesting their tobacco for their cigars or the cotton for their clothes, as long as it’s not them, its not of importance to them. The route of the Triangle Trade. Harriet also mentions the Middle passage. The Middle Passage is about the grueling trip in between Africa and the West Indies. According to an article entitled, “ Middle Passage in the Triangular Slave Trade: The West Indies”, it says, “In his study about the Atlantic slave trade, Thomas (1997) reported that 4,120,000 slaves (a little over 36% of the total trade) were imported into the West Indies (i.e., British, French, Dutch, and Danish Islands)..”. The majority of the slaves went to the West Indies and had to suffer through the trip which could at time take 3 weeks, weather permitting. Harriet’s contempt comes from him being knowledgeable about what his ancestors had gone through. The long ride,the diseases being spread due to the confined space where you couldn’t stand not to mention the thousands of people who didn’t make it through the trip and their shipmates were either forced to throw them overboard or leave their body to rot in conditions that were already horrible.